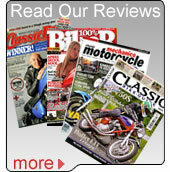 We handle nearly all types of standard Telescopic motorbike fork, including upside down sets. Once separated from the yoke/triple tree, most stanchions are exactly the same in principal and can be repaired in the same way. Materials: Motorbike forks are generally made from cold drawn seamless tube (to BS specification) with a coating of hard chrome. About Forks: The fork tubes link a motorcycle's front wheel to the front of the frame and are generally used in pairs, called motorcycle forks. Fork tubes house the front suspension assembly and compress and extend to adjust for inconsistencies in the road, allowing the front tyre to maintain contact with the road for better handling and braking without the rider feeling the up-and-down movement of the wheel. Some of the motorcycle's weight is riding on the forks, so inside the tubes there are springs and fork oil to make the fork tubes act as a shock absorber. Some forks have the facility to be pressurised with air and adjusted through a valve in the top of the fork. A more common form of adjustment is a screw at the top of the fork which presses down on the fork spring. Turning the screw increases or reduces the pre-load on the spring, letting the rider adjust the amount of negative fork travel. This has no effect, however, on the spring rate except if the springs have a progressive rate, in which case the 'softer' part is used up first when increasing pre-load, letting them appear 'stiffer'. 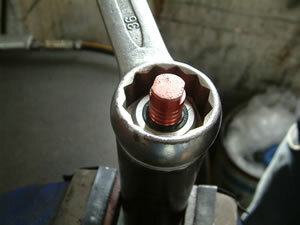 Some forks also allow damping adjustment. This is typically done through a screw-type adjuster in the top of the fork. The adjuster is connected to a rod that, when rotated, selects differently-sized orifices that control the flow of fork oil. The larger the orifice, the more freely the oil flows, and the less damped is the fork. 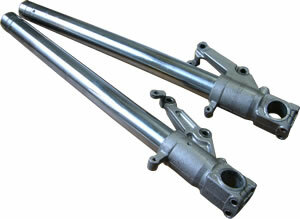 Cartridge forks provide better performance by having regressive damping. Cartridges in the forks contain damping orifices that are covered by springs. With small forces on the fork, the springs resist the flow of oil and the damping is higher. With higher forces on the fork the springs are forced back allowing the flow of more oil and less damping. Thus the fork is stiffer when responding to small bumps in the road, but will soften as larger bumps are encountered. The fork tubes are held together by a part called a triple clamp. There is an upper and a lower triple clamp to stabilize the forks; together these constitute the triple tree. At the bottom of the forks there is a special slot to hold the axle. The front wheel fits between the two forks, the axle harnessing the lower ends of the forks together.